Well, I escaped for a few days - and my humble apologies for the lack of posts as a result. The opportunity to have some time away came up rather suddenly and, bearing in mind that we are in the three-week break between Hungaroring and Valencia, with little happening in the F1 world, I grabbed the chance. But it's back to work now! The lack of news does leave me wondering about subjects, however. PitPass has an interesting article on the possible reasons for Bernie's agreement to change the venue of the British GP to Donington Park but it is largely speculation. The rumor market is quiet for the time of year, with most teams fairly set on retaining their status quo, and when Adrian Sutil's decision not to have a girlfriend at this stage in his career makes the news, it is fairly obvious that nothing is happening. One matter that has surprised me a little is the way in which Nico Rosberg's reputation has plummeted this year. From being one of 2007's new stars, Nico's results have headed steadily downwards after his third place in Melbourne. Judging by comments on blogs and forums, F1 fans have become disillusioned as a result, rating Rosberg ever lower in their driver assessments. This is partly the result of the hopes that were built up over the off season. The Williams FW30 was one of the quickest cars in testing and memories of previous periods of success for the team were stirred. And then it all went flat when the races began - instead of challenging the front runners, Williams have apparently been unable to keep pace with the development speed of the other teams and their results get worse, not better. Some of the blame for this inevitably rubs off on Rosberg. We wonder about his ability to help the engineers perfect the car, about his commitment and talent, forgetting his magnificent performances in 2007. It does not help that his team mate, Kazuki Nakajima, has proved much better than most suspected and the fact that the rookie beats Rosberg on occasion only raises more doubts. Is Rosberg over-rated and Kazuki flattered by being almost his equal? 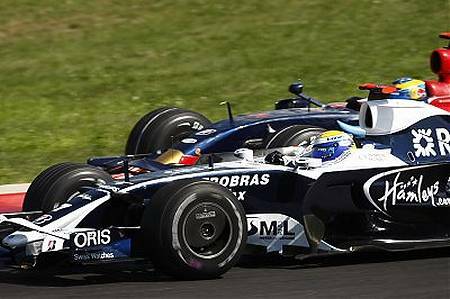 Or is Nakajima much better than anyone guessed and both drivers getting as much out of the FW30 as possible? I think that the truth lies somewhere in between these extremes. The car is certainly nowhere near as good as it promised to be and has a tendency to be quicker in practice and qualifying than in the race. This has meant that Rosberg can usually force a decent grid position out of it but fades in the race. Ironically, Nakajima looks better because he has difficulty in qualifying well but manages to finish higher than his grid spot through staying out of trouble. Meanwhile Rosberg is wiping off the nose of the car in his desperation to move up places and the subsequent pit stop puts him behind Kazuki. It is a tough year for Rosberg, therefore. Feeling that he somehow has to live up to the promise of the previous season, he is at the limit all the time and that is when things can become a little ragged. I am sure that he has the talent to be a strong opponent for the likes of Hamilton and Kubica in the future - but this is his learning year, when he must gain the wisdom to be steady even when circumstances are against him. Hamilton has had such periods and emerged even stronger and Rosberg will too, in my opinion. His loyalty to Williams will make the process longer than Hamilton's however. McLaren can bounce back from poor races with hardly a breath taken; Williams are still trying to reach competitiveness on a much tighter budget. Sir Frank Williams' insistence that the team remain independent may be laudable, but it more or less guarantees that they will not become the team to beat unless a miracle happens. And Rosberg cannot hope to be champion while that continues. So Nico must move when the opportunity comes. He is committed to Williams for 2009 but, beyond that, he must hope that one of the top teams wants him. And, with McLaren looking settled for the long term, Ferrari dancing with Alonso, and BMW apparently happy with what they have, there could be very few attractive seats available, come 2010. I, for one, hope that Nico gets the break he deserves but it is not looking all that bright for him at the moment. I think in this modern day of F1, perhaps Nico (and he certainly is not alone in this) suffers from the fact that the car means a bit more to the success equation than the driver. I can't blame him for losing a bit of motivation - I am hopeful that future rule and design changes allow for more passing in F1 - Seriously, for several years now, the GP2 races are far more interesting to watch than F1. F1 needs to return back to the concept of mechanical grip. Can't say I've been all that impressed with the few GP2 races I've seen but you're certainly right about the cars' importance to winning these days, AJ. Hopefully, the new regulations will improve things and make it easier for the really talented drivers to shine. I agree 100% Clive, I believe that the pace that Rosberg showed until about the 5th race of the season is still there but as AJ14 said the car is too important to success now. The FW30 appears to be going backward compared to the rest of the midfield and I think Rosberg is overdriving trying to get it up the grid. Williams seem very confident about their KERS for next season so maybe that will push them up the grid a bit. Rosberg I am sure will win many races in the future if he can get himself into a good seat. The problem he has is that the only good seats are at McLaren and Ferrari. He has already dodged Lewis Hamilton and McLaren and I can't see him going to Ferrari to play second fiddle to Alonso at Ferrari.